Since its original publication in 1978, Delirious New York has attained mythic status. Back in print in a newly designed edition, this influential cultural, architectural, and social history of New York is even more popular, selling out its first printing on publication. Rem Koolhaas's celebration and analysis of New York depicts the city as a metaphor for the incredible variety of human behavior. At the end of the nineteenth century, population, information, and technology explosions made Manhattan a laboratory for the invention and testing of a metropolitan lifestyle -- the culture of congestion -- and its architecture. Manhattan, he writes, is the 20th century's Rosetta Stone . . . occupied by architectural mutations (Central Park, the Skyscraper), utopian fragments (Rockefeller Center, the U.N. Building), and irrational phenomena (Radio City Music Hall). 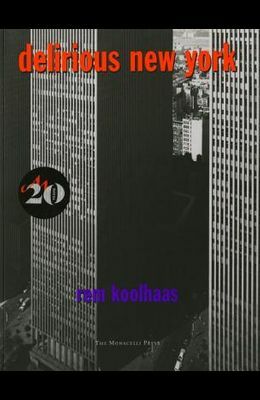 Koolhaas interprets and reinterprets the dynamic relationship between architecture and culture in a number of telling episodes of New York's history, including the imposition of the Manhattan grid, the creation of Coney Island, and the development of the skyscraper. Delirious New York is also packed with intriguing and fun facts and illustrated with witty watercolors and quirky archival drawings, photographs, postcards, and maps. The spirit of this visionary investigation of Manhattan equals the energy of the city itself.